The Mekong Delta (in Vietnamese: “đồng bằng sông Cửu Long” (“Nine Dragon river delta”) is the region in southwestern Vietnam where the Mekong River approaches and empties into the sea through a network of distributaries. The Mekong delta region encompasses a large portion of southeastern Vietnam of 39,000 square kilometres. The size of the area covered by water depends on the season. The heart of the Mekong Delta are Can Tho, Vinh Long and Sa Dec Provinces, from where it is possible to reach the remotest confines of the delta, South towards the mangroves and the South East Asia Sea, North towards Chau Doc, or West towards the island of Phu Quoc. 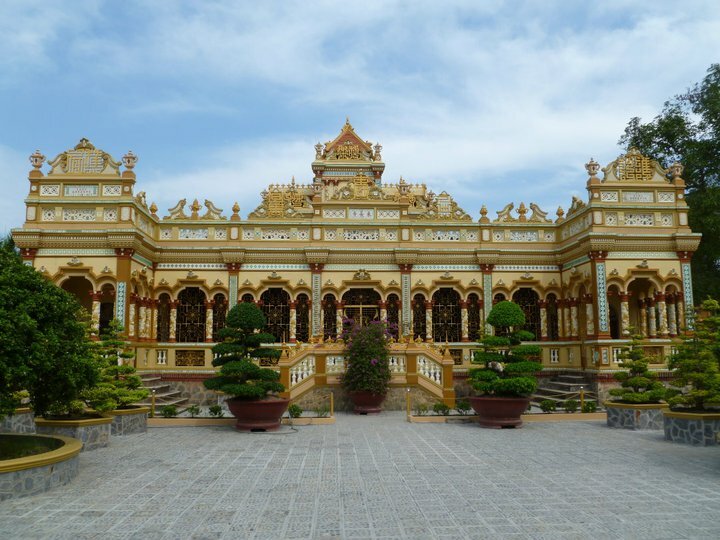 An Giang Province is best-known for being home to pastel-painted Chau Doc, the closest large town to the Vietnamese/Cambodian border crossing on the Mekong River. Wedged between the Cambodian frontier, Kien Giang and Can Tho provinces to the south and Dong Thap province to the north, An Giang is a particularly riverine province, with both the Bassac and Mekong Rivers within its boundaries. The nondescript provincial capital Long Xuyen lies around 50km southeast of the border with Cambodia. Some travellers may find it convenient to pass through here for its transportation connections but there are otherwise few other reasons to stay in the capital. Long Xuyen boasts a sprawling and rather interesting riverside market, a huge cathedral and a smattering of colonial relics, but is otherwise a nondescript spot. Few travellers and backpackers choose to stay here and it is easy to see why - most head here only to make a transport connection. Nevertheless ample accommodation aside from the dozen dodgy places outside town are on offer and restaurants are scattered across town. The most interesting attraction in Long Xuyen town itself is the massive wet market that runs along the river's edge to the east of the central pier, where you could easily lose yourself for a couple of hours. From the pier, you can also organise short boat trips into the surrounds, priced by the hour. You needn't look for a boatman or woman - they will find you. Aside from the market and a boat trip, start planning your escape to a more interesting destination. Chau Doc sits at the junction of a tributary linking the Bassac and Mekong Rivers and the Bassac River itself. An incredibly friendly and bustling little city, Chau Doc has a colour scheme to match its ambience, with bright pastel hues of green, blue and purple adorning many of the newer shopfronts. If you're arriving here from Cambodia, be prepared for the shock into technicolour paradise. Chau Doc locals are known for being very warm and approachable - even the xe dap loi drivers, as pestering as they are, are friendly. English is spoken in most of the foreigner - targeted guesthouses and hotels, and most restaurants have an English menu. A highlight of a visit to Chau Doc is a boat trip on one of the small paddle boats that collect near the western end of the park. For a few dollars an hour they will paddle you around the many floating raft houses and fish farms. Doing this at dawn can be very photogenic and rewarding. Chau Doc is also the closest large town to the Vietnamese/Cambodian river border crossing. If you're heading to or from Phnom Penh by boat, you'll pass through Chau Doc, so try to allow for an overnight stay. Ben Tre Province is made up of three main islands wedged between the Tien Giang River to the north and to Co Chien River to the south with the Ham Luong River running straight down the centre. All are effectively offshoots of the Mekong River as it splits out into many fingers before spilling out into the South South East Asia Sea. Famous for its coconut desserts, the province is suitably covered in coconut trees. During the war these coconut trees were used to make coconut oil which was then used as a valuable substitute for kerosene. As far as exploring the Delta is concerned, Ben Tre is a dead-end province. Once you have experienced all the province has to offer, you will need to turn around and head back through My Tho to get any further into the Delta. That is not to suggest it is not worth visiting - it is. For starters, you can do boat trips from here for a fraction of the price of a trip from My Tho (either organised through Ben Tre Tourist, or via the boatmen at the pier) and, with its large network of minor canals, there is a lot of scope for riverine exploration. There is also a small museum and a pleasing riverfront worth investigating. Ben Tre is clean -- it's as if somewhere between the My Tho ferry crossing and downtown you pass through a cleanliness vortex - the roads are spotless, the pavements are tiled and smooth and there's little refuse - even in the market. Can Tho Province sprawls westwards from the eponymous provincial capital along the southern bank of the Bassac (Hau) River -- the larger of the two branches of the Mekong River. 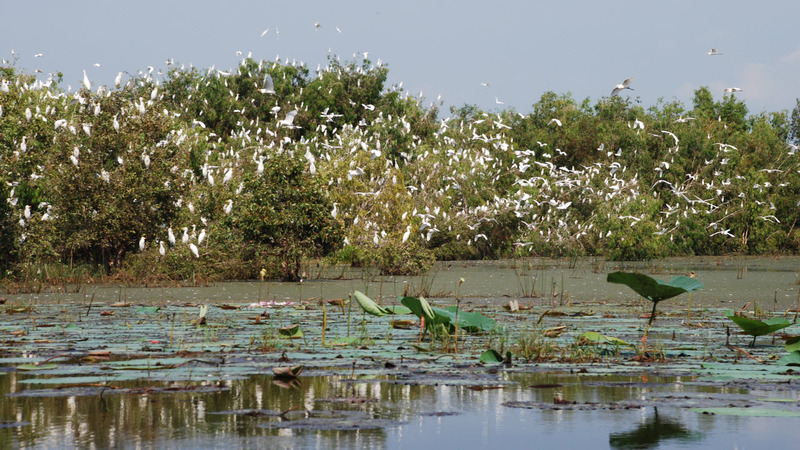 Bordered to the west by An Giang and Tien Giang provinces, to the south by Hau Giang and to the north, on the other side of the river, by Vinh Long and Dong Thap, Can Tho Province is one of the most popular Delta destinations among travellers and tourists alike. The province is actually a municipality which was given provinical status when it was carved out of the larger original province (also called Can Tho) in 2004. The remainder forms the new province of Hau Giang which lies to the south. This elevated status reflects Can Tho's importance in the region, both as a trading and transportation hub and as home to the Delta's largest city. Home to over a million people, Can Tho City is the logical hub for anyone planning on exploring the province. With a wealth of hotels and guesthouses, a very well developed and affordable tourism infrastructure, a healthy supply of eateries and a selection of interesting floating markets within easy reach, it really is difficult to fault - if you've got time for just one destination in the Delta, this is where you should be heading. The Delta is often refered to as Vietnam's rice basket, and Can Tho Province, with its tremendously fertile soil is one of the largest producers in the region. Aside from rice, it also grows masses of fruit from its many orchards and farms and it's these goods which tourists flock to see in the floating markets dotted around the capital. 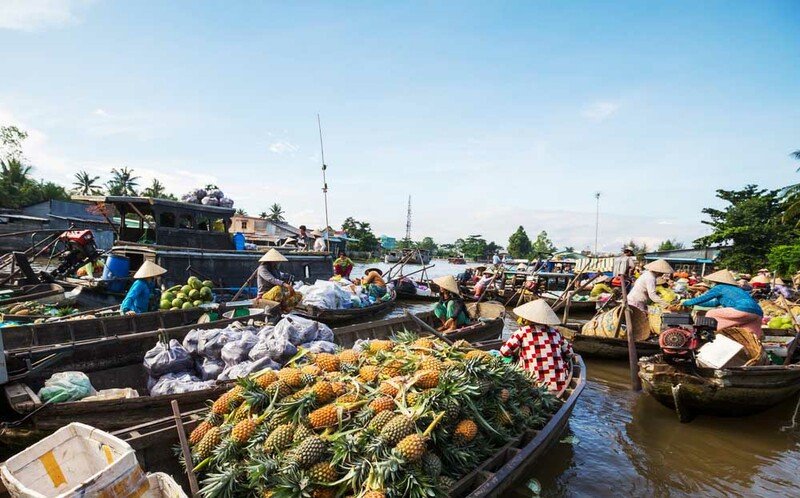 The main reason visitors come to Can Tho is to tour the nearby floating markets. While these are highly recommended, the riverfront promenade itself is also pleasant with some good places to eat and relax in. The city has a good range of accommodation from cheap backpacker haunts right through to comfortable mid-range digs and its urbane atmosphere contrasts to the more rural feel of the towns further out in the Delta. The large, curving province of Kien Giang is wedged between the Gulf of Thailand, Cambodia and the rest of the Mekong Delta. Best known for the magnificent Phu Quoc Island, Kien Giang Province has some engaging towns and a few good stretches beaches as well. Aside from Phu Quoc, the province also has beaches and caves around Ha Tien and Hon Chong - the landscape is not unlike that around Ninh Binh in northern Vietnam with limestone outcrops. The provincial capital, Rach Gia, is a bustling little seaport town with some fine eating, good hotels and lots of friendly people. It's an interesting region, where Vietnam almost seems to merge with Cambodia - a few days of relaxed travelling throughout the province will show you an unusual side of the country that almost no tourists get to see. Tien Giang Province is the closest Mekong Delta province to Saigon and is a very popular destination for organised tours out of Saigon. The provincial capital sits on the northern bank of the Mekong River and has a number of offshore islands that can be visited. Most tours throughout Tien Giang Province run in boats that seat 20-plus people and while such numbers bring costs down to a more reasonable level. If you are interested in exploring riverine life, you can head further south to Can Tho or west to Chau Doc, where prices far more reasonable and well-tailored to independent travellers. Tra Vinh is a very pretty little provincial capital. A hodgepodge of colonial shopfronts face onto broad, tree-lined streets clustered around a fine little market and while very few people speak English, there is certainly no shortage of smiles - Tra Vinh may be well off the tourist trail, but it is an amazingly friendly place. The province has a large ethnicly Khmer population and the area immediately around the market feels (and looks) particularly Khmer - first impressions brought Tachmau or Takeo to mind. This Khmer influence is more obvioulsy seen in the pagoda's that litter both the town and the province. Unlike many Mekong Delta cities, Tra Vinh sits on the bank of a small festy canal rather than a large river, so there's not quite the scope for boat trips that there is in other regional cities, and smiling faces and Khmer pagodas aside, the town isn't exactly bursting at the seems with textbook attractions. The small and roughly oblong-shaped province of Vinh Long sits on a long drawn-out Delta island, with the Tien Giang River running along its northern border and the Hau Giang River running to its south. Tra Vinh sits to the east, serving as buffer to the South South East Asia Sea and Sa Dec borders to the west. Best known for the floating market at Cai Be (which is actually in Tien Giang province, but covered here as it is most often visited from Vinh Long) and the Mekong Delta homestays that can organised from here, Vinh Long Province sees a trickle of travellers passing through, but only a fraction choose to stay overnight at the same-named provincial capital. Sa Dec is another of the main cities on the delta. The town has lost part of its character since the capital of the province of Dong Thap was moved to Cao Lanh. Formerly the town of Sa Dec was the center of the Chan Lap civilization. Currently people of Vietnamese, Chinese, Khmer and Cham origin live in the area. You can also finish your Mekong Delta tour in Rach Gia, the City of Kien Giang Province. From there, you can take a fast ferry, or a plane, to the paradisiacal island of Phu Quoc. Phu Quoc Island is also known as the Emerald Island because of its tourism potential. Until recently, this was a fishing island known only among Vietnamese for its fish sauce. The color of the waters, the soft sand beaches, the landscapes and the sunsets in Phu Quoc are spectacular. The island of Phu Quoc has a triangular form. Although tourism is developing fast, this is still a fishing island. Every day, you can see fishermen going to the sea first thing in the morning. In the afternoon, they come back, most of the times with their nets full. Thanks to the island's warm weather, you can swim all day (and all night) long. Specially recommended is a swim during sun set. Can you imagine what it is like to swim in these golden waters? Foreign tourists can book Mekong delta tours with travel agencies as it is not easy for foreigners to take care of the transportation and accommodation at the stops in Mekong delta. 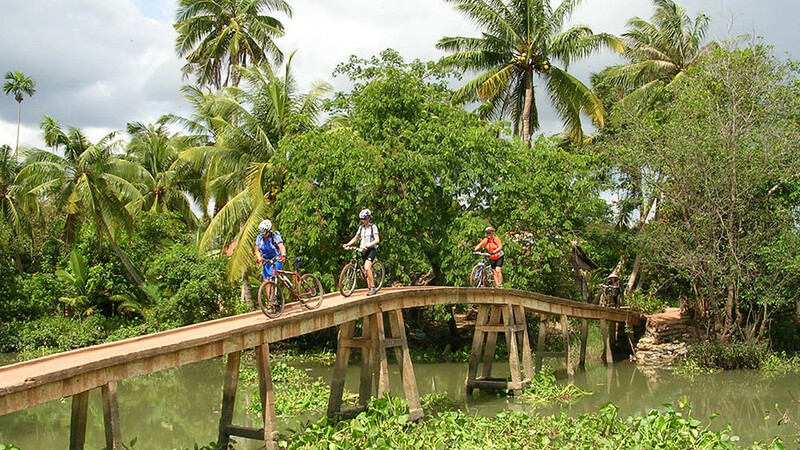 Tours to Mekong delta can vary in duration, those who wish to explore more of this area can choose tours with more days in their itineraries. 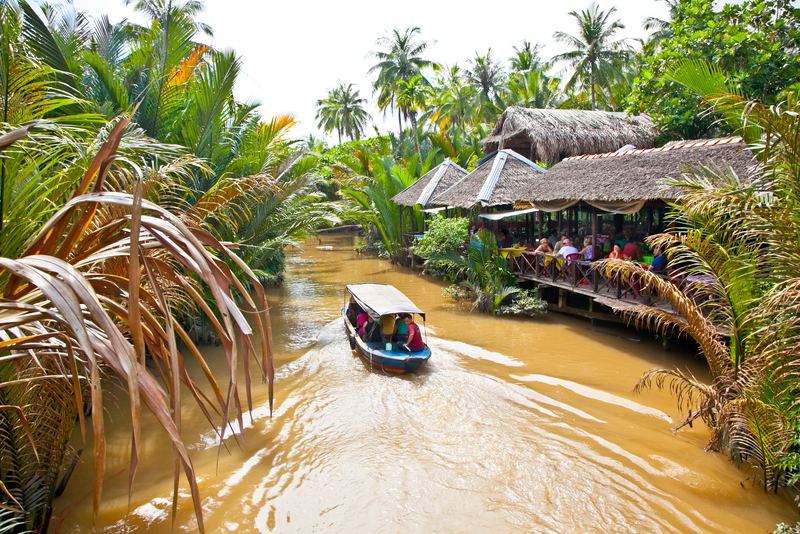 For one day tours, tourists can choose itineraries that include visiting floating markets - one of the highlights of Mekong delta, or a day trip to Can Gio eco-forest - best choice for nature lovers.